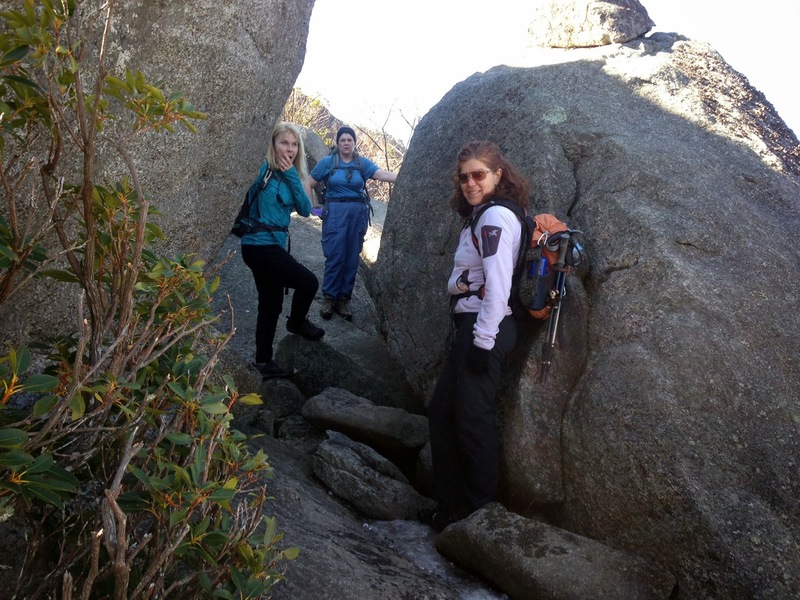 It was a beautiful sunny and warm day for the first Old Rag hike of the year. 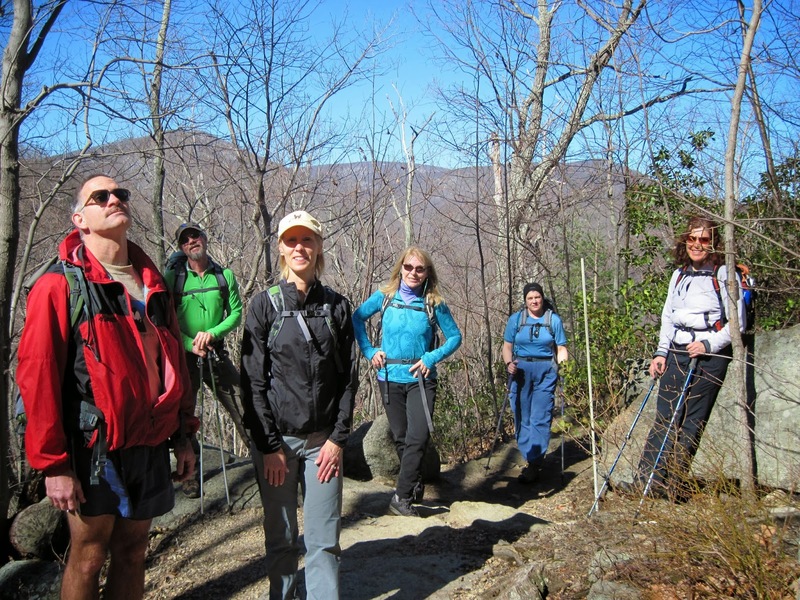 Dan Ralston led the 9 mile hike and he was joined by Kelly O’Rourke (a new hike leader), Jeanne Densmore, John Brandt, Susanna Williams, CJ Woodburn, Iva Gillet and Bill Holman. 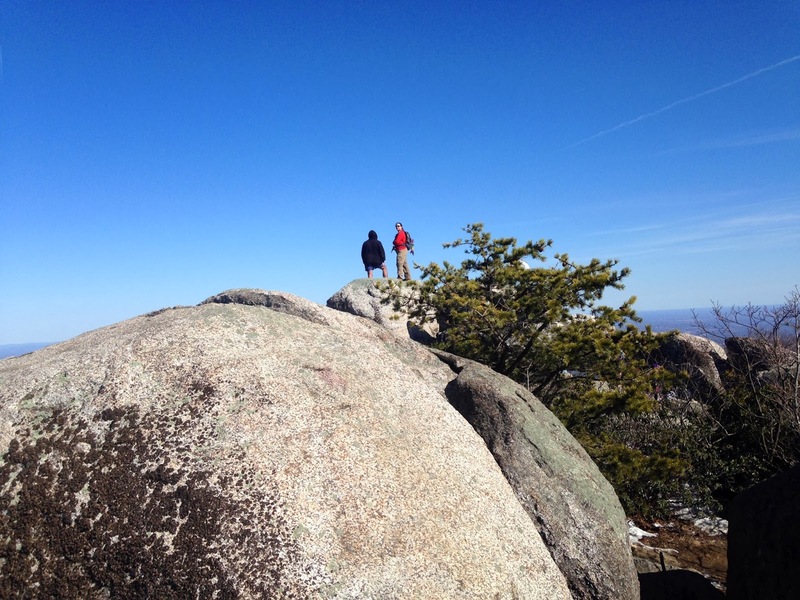 From the Old Rag parking lot we hiked up the Ridge Trail, and then we did the partially iced rock scramble to the top. The sky was perfectly clear and the views were panoramic. We returned by the back side to the Weakley Hollow Fire Road. 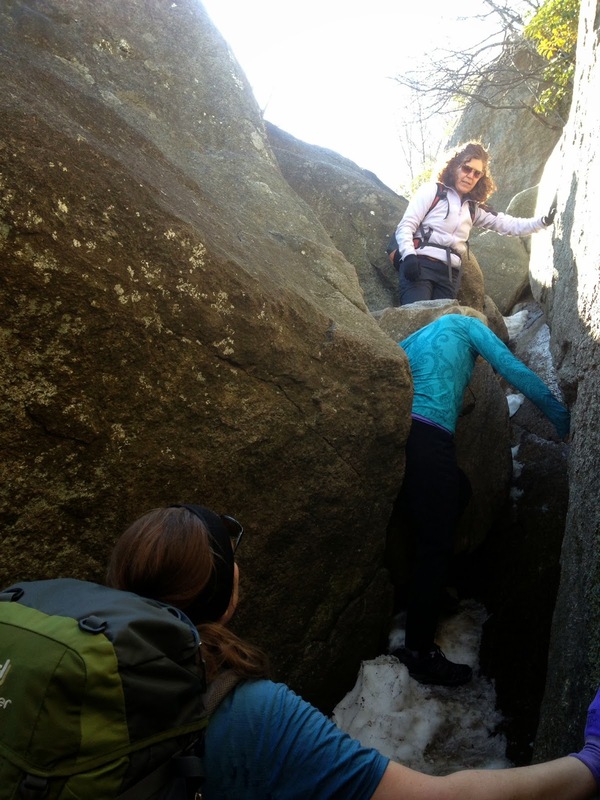 While there was a chance of snow in the day’s forecast, that did not keep a hearty group of 23 hikers from traveling to the top of Snow Mountain to hike a five mile loop on Governmental land located near the PATC’s Mutton Hollow/Vining tracts. After John Shannon gathered hikers at AHS, the caravan proceeded to Iva’s farm to form carpools prior to the short drive to Snow Mountain. Joining John at AHS were David Carter, Pete Fink, Seth Ray and his Weimaraner. Susanna Williams, Sunny Choi, Brian Muszynski, Brad Young, Neil McKinney, CJ Woodburn, Leon Gorman, and first timer Jeanne Siler who recently traveled with Bill Holman and Iva Gillet for 4 months on the Semester at Sea fall voyage. Also John Herrid with his neighbors Jeff and Chris Wagner plus their 2 dogs Joining this group at the farm were Dan Ralston, Bill Holman, Jeanne Densmore, Briana Taylor, Andy Willgruber, Dave Borszich, Marc Erlandson, Rich Bard, and Linda Ginsberg. Our six car carpool traveled the twisty gravel road up Snow Mountain driving through a spring crossing the road complete with a waterfall upstream, as snow flakes began to fall. Not wanting to risk deteriorating road conditions, Leon off loaded his passengers and returned to the farm, seemingly to help CJ, who stayed at the farm to keep the soup warm and woodstove roaring. 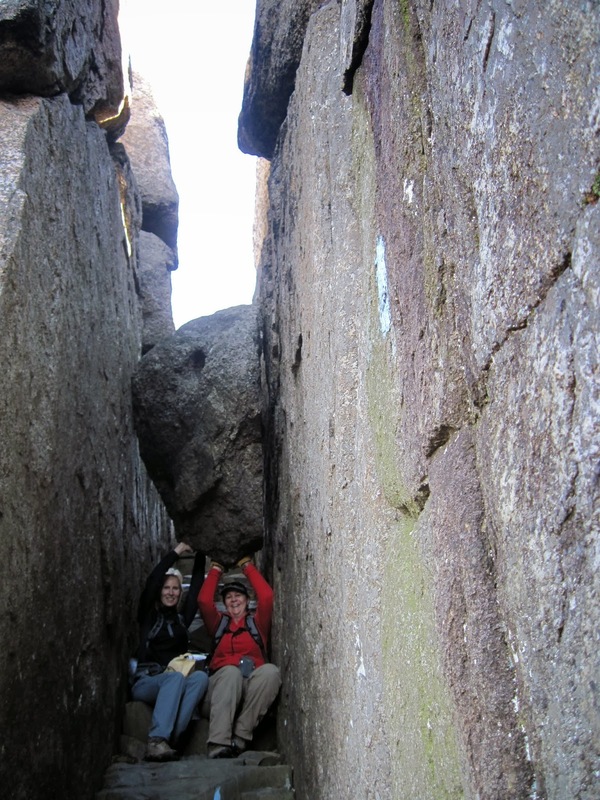 After tucking our cars in the parking spaces at the end of Snow Mountain road, a mile from the Skyline Drive, we hiked the road and initially headed for a shelter that was built years ago for AT thru hikers. Trails never were developed from the AT to this spot, so the shelter is overgrown as is the trail. Briars were a constant challenge as we began the slow ascent. Action figure Dave blazing the way! John Shannon, ever ready for trail work, had bought loppers and worked diligently to clear the limbs and briars from the seldom used trail. Winding through the woods, we eventually arrived at a fire road that is at the end of Haneytown Road. 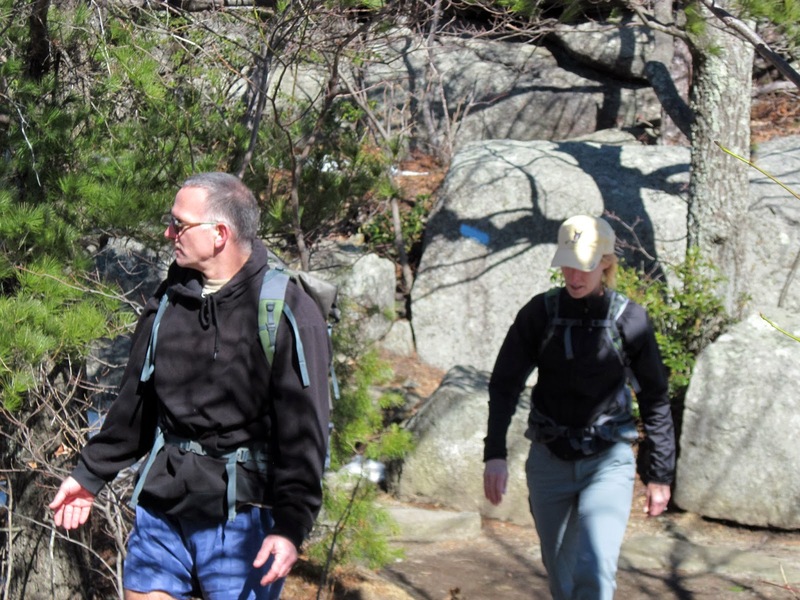 Local residents Marc and Iva discussed future hikes using this access point. Climbing the hill, we walked to the edge of Bacon Hollow which was (is?) known for the moonshine made here. There are waterfalls too, but none could be visible this day. While we had a short snack break, Brian climbed down the rocks from our vantage point and then back up. Sunny then demonstrated her yodeling skills, learned during her college days, into Bacon Hollow, but no one yodeled back. With the wind picking up, Bill suggested we should not linger. We ascended the biggest hill of the day, to get our blood pumping. While this spread our group out a bit, we all made it back to the cars and reversed our commute only to find none other than John Brandt walking up the road. Since his car had not been able to make the trip, and he didn’t know where the group was going, he enjoyed a hike on his own. Brad Young kindly offered him a ride back to his car. Another hitch hiker was also found on the way back for soup; Leon who wanting to get some exercise after returning his car to the farm, had walked all the way down Rt 810 to Snow Mountain Rd. Andy, Briana and Rich somehow added him to the front of Andy’s pick-up and headed back. CJ had everything prepared and we enjoyed beef stew, vegetable and chicken chili. There was Tomato Basil soup from Zazus, lots of bread, and good conversation. Dan lead a group to the horse fields so that they could enjoy some carrots. Good times had by all! We had a nice break from the recent cold temperatures, with a sunny day in the 50’s in Charlottesville, but in the upper 30’s in the mountains. Thinking the Skyline Drive would be closed with the recent snow, the hike leader chose a hike that could take place without it being open. 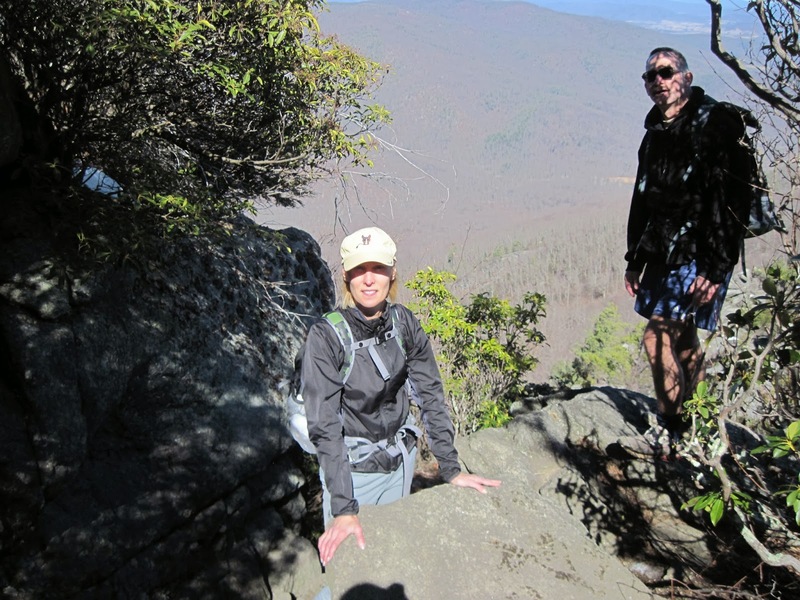 Newcomers Ginny Barber and Tom Keesling chose a good first hike of relatively short distance and rolling terrain. Also joining us were Maynard Davis and David Carter, both who haven’t joined us in a while, and the usual suspects: CJ Woodburn, Sunny Choi, Leon Gorman, Marian Styles, Pete Fink, Brian Muszynski, Jeanne Densmore, John (Shorts) Brandt, with Andy Willgruber and Briana Taylor meeting us at the trailhead. 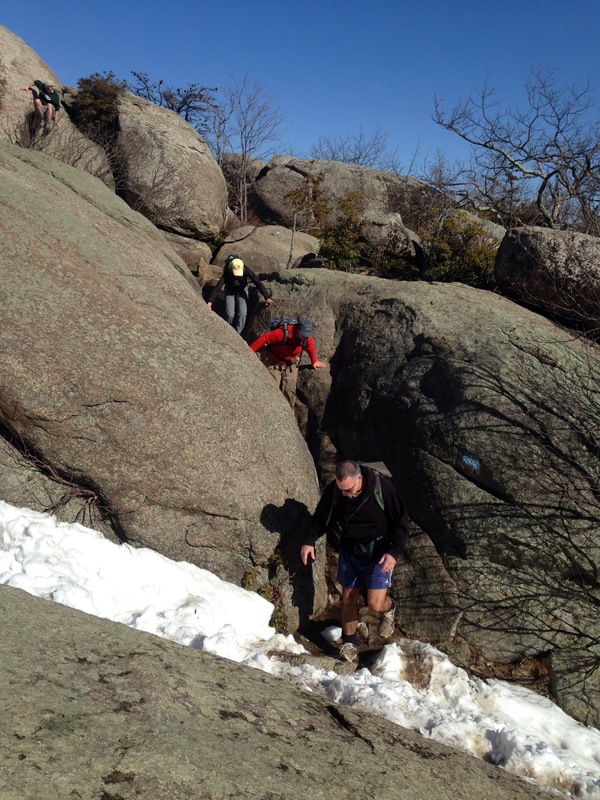 We did hike most of the trail in the snow, which was accentuated by John Brandt’s shorts and tennis shoes. 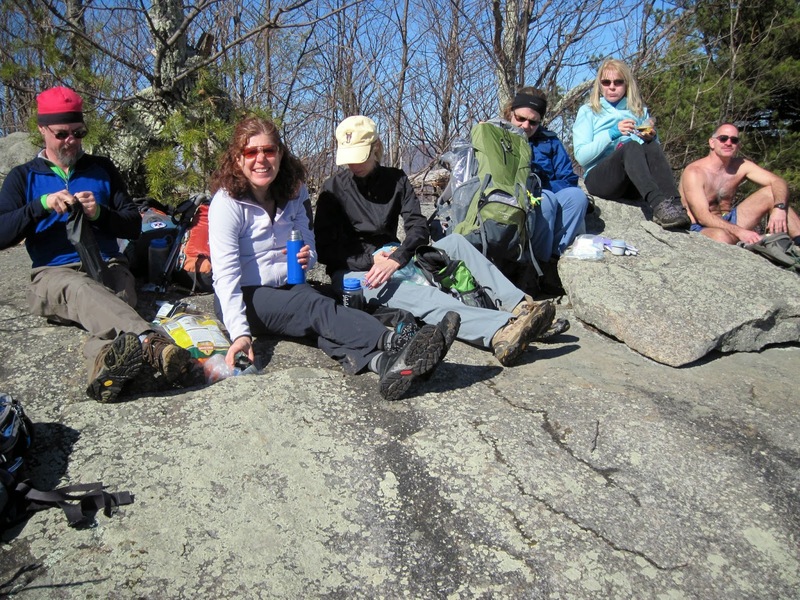 We had the pleasure of meeting up with 3 other hikers who came from Massanutten. It allowed Brian the chance to converse with someone from Germany, perfecting how to say, "I wish I were a chicken." We had our lunch at the maintenance shed where Brian shared cauliflower soup and Iva shared chocolate chip cookies AND brownie walnut chip cookies. We traveled at a leisurely pace, and still finished our hike by 1:30 PM. It allowed us time for outside activities at home after a nice hike in the woods.